A trickling filter is a type of wastewater treatment system. It consists of a fixed bed of rocks, coke, gravel, slag, polyurethane foam, sphagnum peat moss, ceramic, or plastic media over which sewage or other wastewater flows downward and causes a layer of microbial slime (biofilm) to grow, covering the bed of media. 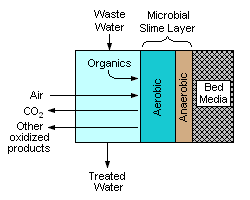 Aerobic conditions are maintained by splashing, diffusion, and either by forced-air flowing through the bed or natural convection of air if the filter medium is porous. 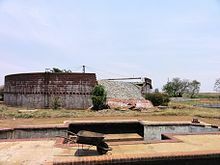 Typically, sewage flow enters at a high level and flows through the primary settlement tank. The supernatant from the tank flows into a dosing device, often a tipping bucket which delivers flow to the arms of the filter. The flush of water flows through the arms and exits through a series of holes pointing at an angle downwards. This propels the arms around distributing the liquid evenly over the surface of the filter media. Most are uncovered (unlike the accompanying diagram) and are freely ventilated to the atmosphere. The removal of pollutants from the waste water stream involves both absorption and adsorption of organic compounds and some inorganic species such as nitrite and nitrate ions by the layer of microbial bio film. The filter media is typically chosen to provide a very high surface area to volume. Typical materials are often porous and have considerable internal surface area in addition to the external surface of the medium. Passage of the waste water over the media provides dissolved oxygen which the bio-film layer requires for the biochemical oxidation of the organic compounds and releases carbon dioxide gas, water and other oxidized end products. As the bio film layer thickens, it eventually sloughs off into the liquid flow and subsequently forms part of the secondary sludge. Typically, a trickling filter is followed by a clarifier or sedimentation tank for the separation and removal of the sloughed film. Other filters utilizing higher-density media such as sand, foam and peat moss do not produce a sludge that must be removed, but require forced air blowers and backwashing or an enclosed anaerobic environment. The bio-film that develops in a trickling filter may become several millimetres thick and is typically a gelatinous matrix that contains many species of bacteria, cilliates and amoeboid protozoa, annelids, round worms and insect larvae and many other micro fauna. This is very different from many other bio-films which may be less than 1 mm thick. Within the thickness of the biofilm both aerobic and anaerobic zones can exist supporting both oxidative and reductive biological processes. At certain times of year, especially in the spring, rapid growth of organisms in the film may cause the film to be too thick and it may slough off in patches leading to the "spring slough". 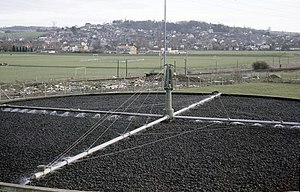 A typical trickling filter is circular and between 10 metres and 20 metres across and between 2 metres to 3 metres deep. A circular wall, often of brick, contains a bed of filter media which in turn rests on a base of under-drains. These under-drains function both to remove liquid passing through the filter media but also to allow the free passage of air up through the filter media. Mounted in the center over the top of the filter media is a spindle supporting two or more horizontal perforated pipes which extend to the edge of the media. The perforations on the pipes are designed to allow an even flow of liquid over the whole area of the media and are also angled so that when liquid flows from the pipes the whole assembly rotates around the central spindle. Settled sewage is delivered to a reservoir at the centre of the spindle via some form of dosing mechanism, often a tipping bucket device on small filters. Larger filters may be rectangular and the distribution arms may be driven by hydraulic or electrical systems. Single trickling filters may be used for the treatment of small residential septic tank discharges and very small rural sewage treatment systems. Larger centralized sewage treatment plants typically use many trickling filters in parallel. Systems can be configured for single-pass use where the treated water is applied to the trickling filter once before being disposed of, or for multi-pass use where a portion of the treated water is cycled back and re-treated via a closed loop. Multi-pass systems result in higher treatment quality and assist in removing Total Nitrogen (TN) levels by promoting nitrification in the aerobic media bed and denitrification in the anaerobic septic tank. Some systems use the filters in two banks operated in series so that the wastewater has two passes through a filter with a sedimentation stage between the two passes. Every few days the filters are switched round to balance the load. This method of treatment can improve nitrification and de-nitrification since much of the carbonaceous oxidative material is removed on the first pass through the filters. Trickling may have a variety of types of filter media used to support the biofilm. Types of media most commonly used include coke, pumice, plastic matrix material, open-cell polyurethane foam, clinker, gravel, sand and geotextiles. Ideal filter medium optimizes surface area for microbial attachment, wastewater retention time, allows air flow, resists plugging is mechanically robust in all weathers allowing walking access across the filter and does not degrade. Some residential systems require forced aeration units which will increase maintenance and operational costs. Large tanks or concrete enclosures filled with plastic packing or other media. Vertical towers filled with plastic packing or other media. The availability of inexpensive plastic tower packings has led to their use as trickling filter beds in tall towers, some as high as 20 meters. As early as the 1960s, such towers were in use at: the Great Northern Oil's Pine Bend Refinery in Minnesota; the Cities Service Oil Company Trafalgar Refinery in Oakville, Ontario and at a kraft paper mill. The treated water effluent from industrial wastewater trickling filters is typically processed in a clarifier to remove the sludge that sloughs off the microbial slime layer attached to the trickling filter media as for other trickling filter applications. Some of the latest trickle filter technology involves aerated biofilters of plastic media in vessels using blowers to inject air at the bottom of the vessels, with either downflow or upflow of the wastewater. ^ Marcus Van Sperling (2007). Activated Sludge and Aerobic Biofilm Reactors. IWA Publications. ISBN 1-84339-165-1. This page was last edited on 19 March 2019, at 13:53 (UTC).